VERO BEACH – At approximately 12:00 p.m, the Indian River County Sheriff’s Office received a call of an armed carjacking in the Ryanwood Plaza, at the corner of 58th Avenue and State Road 60. 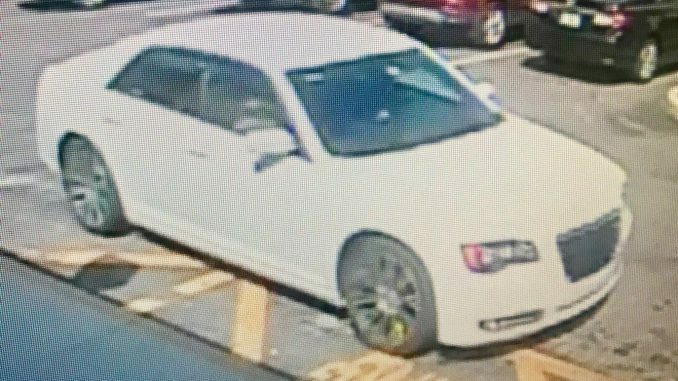 In front of the Publix store, an unidentified man jumped into the passenger seat of a white Chrysler 300 bearing Florida tag Y74DMD, occupied by an elderly white female. The man produced a handgun and forced the woman to drive to the parking lot of Bank of America. The female saw other people standing outside of the store and courageously exited the vehicle towards those standing outside of the bank. The suspect, described as a light skinned man possibly of Middle Eastern, Hispanic, or African American descent, then got into the driver seat and fled the store west on State Road 60. Detectives are now on scene speaking with the woman and witnesses. Out of precaution, Bank of America executed their lock down procedures. As more details on the suspect become available, they will be released. “We need your help to get this dangerous man off the streets. To kidnap this elderly woman at gunpoint in broad daylight shows how dangerous he truly is. Please take a close look at the vehicle and tag, and call 9-1-1 if you spot the vehicle,” Indian River County Sheriff Deryl Loar stated. You can remain anonymous and possibly be eligible for a reward of up to $3,000 by contacting Treasure Coast Crime Stoppers at 1-800-273-TIPS (8477) or www.tcwatch.org .